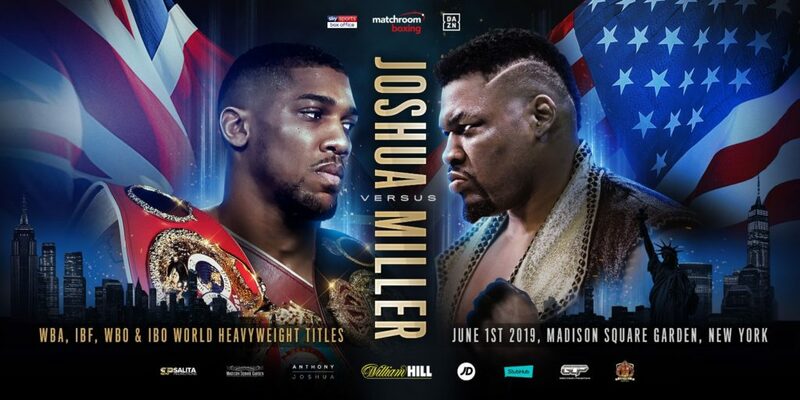 Historic clash screened live on Sky Sports Box Office in the UK and DAZN in the U.S.
Heavyweight boxing’s biggest star Anthony Joshua OBE will defend his WBA Super, IBF, WBO and IBO World titles against Jarrell Miller in his long-awaited U.S. debut at the iconic Madison Square Garden in New York on Saturday, June 1, live on Sky Sports Box Office in the UK and DAZN in the U.S.
“It’s been an eventful few months but I’m delighted to finally announce that Anthony Joshua will make his American debut at the iconic Madison Square Garden on June 1,” said Eddie Hearn, Matchroom Boxing Managing Director. “AJ has created an incredible ‘Lion’s Den’ atmosphere in the UK and we plan to bring that energy to New York on a card that will be stacked with British vs. American talent. When you look at the Heavyweight greats that have graced the renowned ‘Mecca of Boxing’ the names of Ali, Frazier, Marciano and Tyson stand firm and June 1 will be a moment when the World will witness AJ’s turn.